One of the most historic names of Indian politics, Morarji Desai is someone with a distinguished career both on and off the field of politics. He was part of the Indian independence activism and later on served tenure in many prominent positions of Government for both the state and central levels. Having started off in the role of employee in civil service he went onto take many roles in government before becoming the prime minister of India. He was the fourth Indian Prime Minister of India, i.e. Republic of India after the independence of India from the British Raj. He is also part of the esteemed profile and international recognition for his role as the peace activist who helped create peace between the India and Pakistan. A peculiar thing about Morarji Desai is that he has won both the Bharat Ratna and the Nishan-E-Pakistan, both being the highest civilian awards of India and Pakistan. He is the only Indian till date to win both of these. He was born on 29th February 1896 in the village of Bhadeli. Bhadeli village falls under Bulsar district and was part of Bombay Presidency at the time of birth of Morarji Desai. The area is now part of modern-day Gujarat. He was the oldest of the eight children of his family. His father was a teacher. He joined the Saurashtra The Kundla School in Savarkundla from where he completed his primary school. He later on joined the Bai Ava Bai High School where he completed his high school. He then went to Wilson College, Mumbai to complete his graduation. After finishing the graduation, he joined as the civil servant in Gujarat where he worked till 1930 and resigned later on. He was the collector of Godhra at the time of resignation and the reason for it was because he was found to be going soft on the Hindu’s during the riots occurred in 1927-28. He was married to Gujraben in the year of 1911 when he was at the age of 15. His wife lived long enough to see Morarji Desai become the prime minister but died later on. He has a son Kanti Desai and has grandchildren and great-grandchildren. Morarji Desai initially joined the freedom fighting struggle against the British Raj under the guidance of Mahatma Gandhi. He joined the movements which led to him being in the prison. He spent a lot of time in the jail during the movement against the British Raj. During this time, he build a name for himself, as the tough spirited person and one of the best leaders of the Congress of India. His importance shown as he won the provincial elections that were held in the 1934 and 1937. After winning the elections, he was selected as the Revenue Minister and later the Home Minister of the Bombay Presidency. After India became independent from British Raj in 1947, he also got the Chief Ministership of Bombay in 1952. At that time when he became the Chief Minister, Bombay was a very large state holding two language-majority people. One of them was Gujarati-speakers and the other was Marathi speakers. Later on when the protests for separate Gujarati state and separate Maharashtra started happening in Bombay state. Morarji Desai was the chief minister of that time and he was against the division of the state. He instead proposed that Mumbai be made into a union territory or like other developmental regions, but this plan was not accepted by the people. After that, various protests started for the demand of separate Maharashtra, and during one such protest, 105 people were shot after the Chief Minister Morarji Desai allowed the shooting on the crowds by police. The national government then intervened and awarded two different states based on the two major languages, i.e. Gujarati and Marathi. This lead to the creation of state of Maharashtra and Gujarat. During his time as the Home Minister, Morarji Desai made different rules like no portrayal of indecent scenes like the kissing in movies and theatres. He was a avid follower of Mahatma Gandhi and followed the socially conservative tag. His view was different from that of then Prime Minister of India Jawaharlal Nehru who was more socialistic in his approach. Desai was one of the top candidates ever in the Indian National Congress but was overlooked time and again. He was always at a battle with the Nehru’s views and ideology and his supporters. Even during the death of Jawaharlal Nehru in 1964, he was overlooked for the candidate of Prime Minister and instead Lal Bahadur Shastri was given the command. He still made sure that he will build the ranks and support in the camp so as for the future use. In 1966, Lal Bahadur Shastri died and the Prime Minister position was again left vacant. Many thought that Morarji Desai will be the top most candidate for the prime minister title. But he was defeated by none other than Indira Gandhi, the daughter of Jawaharlal Nehru. She became the prime minister of the nation and Morarji Desai was given the role of Deputy Prime Minister and the Finance Minister. He remained in dual roles until 1969 when Indira Gandhi took the title of Finance Minister away from him. He then resigned from the cabinet ministry and formed another faction of the Indian National Congress also known by as the Syndicate. The faction of Indira Gandhi was known by as the Indicate. There was general elections in 1971 where the party of Morarji Desai was defeated very badly by the Indira Gandhi’s party. He although won the seat and got elected as the Lok Sabha member. In 1975, the Allahabad High Court found that Indira Gandhi had done electoral fraud during the 1971 general elections. After that an emergency rule was launched by Indira Gandhi from 1975-77 where she jailed Morarji Desai and many other leaders from opposition in the jail. Later in 1977, due to anti-corruption wave and anti-emergency movements going across India, Congress party was defeated in the elections whereby Janata alliance won the elections majority. 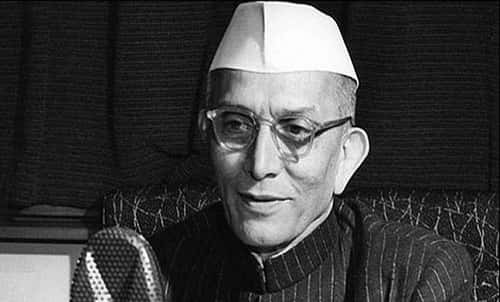 As part of the Janata Alliance, Morarji Desai was chosen as the leader for the Parliament and he became the 4th ever Prime Minister of Republic India and the first non-congress Prime Minister. After the winning of Morarji Desai’s party faction, he became the Prime Minister of India. His win represented a major win for democracy as the emergency that was levied on the India by Indira Gandhi meant many people were unheard of. This was felt by many people across India. What he did after being the Prime Minister was to improve the relations with other nations like China and Pakistan with whom India had been in war on 1962 and 1965 respectively. He opened talks with China, with whom the talks were down since the last 1962 war. He also undid many rules that were made during the emergency and made sure that no future government can levy emergency from now on. His time was marred by the struggle of Janata party or the coalition as there was continuous feet-pulling and fighting inside the party. Add to it, the time just after emergency period of India, his tenure was full of difficulties. India had its first nuclear test done in 1974 and Morarji Desai during his time of Prime Minister kept the Indian Nuclear program and did not divulge even though many nations asked them to close it. Meanwhile, he closed many parts of the Indian RAW also known as the Research and Analysis Wing by cutting it’s budget down. In 1979, after Raj Narain and another leader of Janata Party Charan Singh stepped out from the party, Morarji Desai had to resign as the Prime Minister of India. He then retired from Politics after that. He later on did campaign for the Janata Party again in the 1980 elections but did not contest himself for the position. Morarji Desai lived a retired life and died on 10th April 1995 when he was of age 99. He was during the last years of his life honoured as the freedom fighter of his generation. He lived a vegetarian life and followed the principle of Mahatma Gandhi. He was the first Indian to win both the Bharat Ratna and Nishan-e-Pakistan. Both are the highest civilian honor of India and Pakistan respectively. He was honoured as the Nishan-e-Pakistan by the President Ghulam Ishaq Khan in 1990. He kept an indefinite hunger strike on 12th March 1975 for the support of Nav Nirman movement of Gujarat. He was an avid follower of Mahatma Gandhi and this led to him being against the faction of Jawaharlal Nehru always. He was an advocate of urine therapy and also spoke to Dan Rather on the episode of 60 minutes about the benefit of drinking urine.